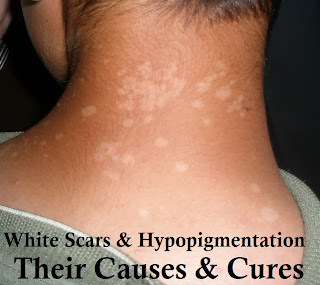 White scars and hypopigmentation (loss of skin coloring) can result from trauma to the skin. Scars take on a white appearance because melanocyte production has been impaired. Melanocytes make melanin- the pigment that gives the skin its color. If melanocytes are damaged, so is the skin's ability to produce darker skin tones. 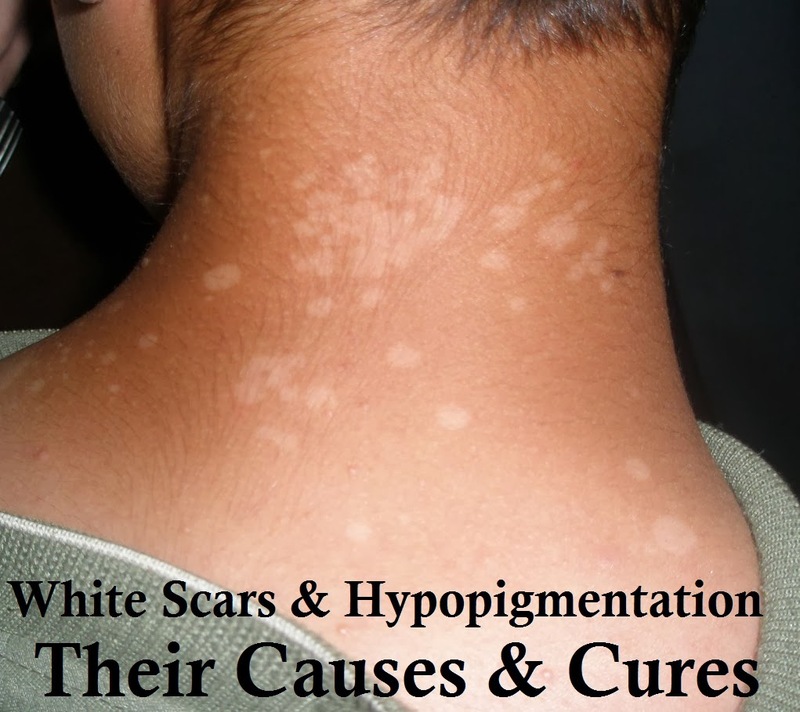 After damage to the skin, whether or not hypopigmentation or white scarring occurs depends on how the injury took place. For example, if you were riding a bicycle, fell and only scrapped your knee, this would have created a superficial abrasion on the skin. A scab would develop to protect the wound. Over the course of the few days, the scab would fall off. Once the scab shed away, the skin would then produce pigment in response to sun exposure and eventually, the color of the scar would match that of the rest of the skin. On the other hand, had the bicycle fall involved a deep gash to the knee, most of the pigment producing layers of the upper skin would be damaged while the deeper layers of the skin would need to repair the injured tissue. To start the dermal repair process, the skin would then knit together collagen and elastin to protect blood vessels beneath the skin. If blood vessel damage occurred, increased amounts of inflammation would accompany the wound healing process. Under these circumstances, a mild form of fibrosis, or excessive scarring, may happen because of the increased in skin damage and inflammation. With this build-up of scar tissue, melanocytes may not reach the surface of the skin where they make melanin and give color to the skin. This results in white, coarse scar tissue. Unlike bicycle accidents, laser re-surfacing is a form of intentional scarring. Since laser resurfacing corrects skin damage by inflicting tiny wounds in the skin, laser treatments can cause hypopigmentation. At times, the hypo-pigmented spots may not show up until two to six months after the laser treatment. Treatments for white scarring that result from acne scars or accidents include medications for vitiligo. Vitiligo is a skin disorder of unknown cause involving loss of pigmentation in patches of otherwise normal skin. Dermatologist Dr. R.W. Urbanek, reported to E Skin and Allergy News that a product know as V-Tar helps combat the effects of hypopigmentation. According to Dr. Urbanek, this compound causes the skin to produce melanocytes which in term create melanin and restore the skin's normal pigmentation. Dr. Urbanek has seen improvements with using V-Tar in as little as eight daily applications. However, side effects of V-Tar include a burning sensation when exposed to direct sunlight. This can be mitigated with using a sunscreen. You can ask you doctor for V-Tar. Ironically, when hypopigmentation results from skin resurfacing, the treatment could involve more laser resurfacing. In a study published in Dermatologic Surgery, Dr. James E. Fulton revealed his method for treating hypopigmentation that resulted from laser or chemical skin resurfacing. Dr. Fulton gave 22 patients who had hypopigmented scars a pre-treatment with a vitamin A and glycolic acid lotion. Next, the patients received a series of laser and chemical resurfacing treatments. After the resurfacing treatments, researchers specially bandaged the treated hypopigmented scars and allowed them to heal. At the conclusion of the study, melanocytes did return to the previously hypopigmented area and ultimately the skin spot blended with the rest of the skin's natural tone. Since hypopigmentation and white scarring have historically proven themselves difficult to cure, the best treatment is really prevention. You can help prevent hypopigmentation by properly bandaging deep wounds immediately after they happen. In the case of skin resurfacing, ask your health practitioner what steps she is taking to avoid post hypopigmentation and what you can do, in addition to wearing a good sunscreen, to prevent possible hypopigmentation. Norra MacReady. Tar Product Tackles Hypopigmentation Quickly. E-Skin and Allergy News: March 2002, Vol 33, no 3, p 39. Fulton J.E., A.D. Rahimi; S. Mansoor; P. Helton; P. Shitabata. The Treatment of Hypopigmentation After Skin Resurfacing. Dermatologic Surgery. January 2004, Vol 30, no 1, pp 95-101(7).